Yellowstone. The name alone invokes a sense of wonder. One of the things that encouraged this new drive to get back out into nature was the Ken Burns Documentary The National Parks: America's Best Idea. 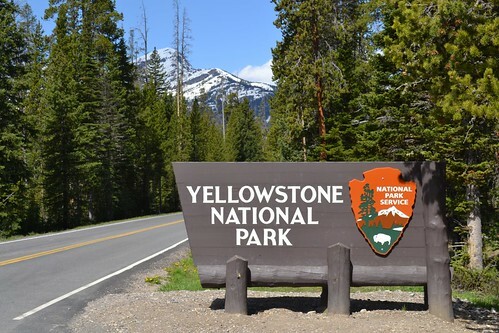 Though there are many beautiful parks featured, Yellowstone stands out! Since watching the documentary, I had this burning desire to see this place of wonder. So, on June 11, 2011 shortly after 1:00 a.m. (yes, really) we left our home in Lee's Summit, MO. It was the year of the heavy snow, followed by flooding. I had been tracking the road openings in Yellowstone and nervously waited as they opened two of the passes only a week before our trip, much later than normal. Thought the mountain roads were clear there was the small issue of I-29 being closed because of flooding. Adding an hour to the trip we headed up K-7 and across US-36 to US-75 North to Nebraska City. I filled up with gas in Lincoln while Laura and Colin slept and then began our journey West on I-80. I had planned this trip to take the scenic route, not the fastest, and we got off the beaten path (I-80) at Kearney, my birthplace. After a quick drive through town and some breakfast we headed North on NE-10 to NE-2. We took Highway 2 to Broken Bow and visited my grandparents grave sites and then on to Halsey to visit the National Forest. Compared to your average National Forest Halsey is not very impressive. That is until you realize that it is not natural, but planted by man. The story goes there was a bet between two brothers on whether or not the sand hills could sustain a forest. I had been driving on Highway 2 all my life taking trips from Omaha to my grandparents house, but I do not recall having been West of Halsey. The plan was to take Highway 2 West rather than I-80 to experience the Nebraska Sandhills. The sand hills are the largest sand dunes in North America and are stabilized by grasslands. This is western Nebraska, ranch land, and it was a gorgeous drive! We turned South at Alliance and headed towards Scott's Bluff with a stop at Chimney Rock. At this point you are on the California, Oregon, Mormon, and Pony Express Trails, now part of the National Trails System. It was not hard to imagine how the pioneers must have felt upon seeing Chimney Rock. One can imagine the long journey and any sign of progress would be welcome, especially one so magnificent. We finished out our 725 mile day visiting Scott's Bluff National Monument before the rain hit. The storm made for some breathtaking photographs! After a good dinner and a good nights sleep, we started off on day 2 of our journey. Leaving Scott's Bluff we soon found ourselves at Fort. Laramie. The fort was well preserved and well worth our time there. Just outside of the fort there is a historic cemetery. We stopped to look and found a stray cat. Colin wanted to keep him, but we settled for giving him some milk, and named him laramie. Heading West on US-26 we came to Guernsey. Just a few miles outside of Guernsey are remnants of the Oregon Trail wagon ruts. It was neat to see such a record of the journey of so many! Slightly West of Guernsey US-26 runs into I-25. I wasn't too excited about getting back on the interstate, but after seeing the grasslands of Eastern Wyoming I have to say it was one of my favorite parts of the drive. Between Douglas and Glenrock we took a brief detour South to Ayers Natural Bridge Park. We stopped for dinner in Casper before getting back off of I-25 and heading West on US-20/26. So far on our trip we had driven through Kansas and Nebraska farmland, and the Nebraska and Wyoming Grasslands. At Casper the landscape started to change. The tall prairie grasses got shorter and the sagebrush started to appear. We were moving into the foothills! A drive to Shoshoni left us disappointed because the famous malt shop had closed. At Shoshoni we turned North on US-20 and drove to Thermopolis through the beautiful Wind River Canyon. I would have liked to spend some more time in Thermopolis and explore the Hot Springs, but we were running out of time as we had spent so much time sightseeing already. We left Thermopolis on WY-120 and found ourselves climbing into the rolling sagebrush covered foothills of the mountains East of Yellowstone. Driving towards Cody the snow covered peaks gave me this feeling that they were protecting something. It was like they were a castle wall with something very valuable hidden behind. Now, I knew what was on the other side, but I still wonder if John Colter got the same feeling from these mountains. Is that what drew him away from the Lewis and Clark Expedition and back into the park? We arrived in Cody around 9:45 and did some shopping before heading towards the park at 10:30. The drive from Cody into Yellowstone via the East entrance is stunning. My only regret is that most of it was after dark and we had only the moonlight to see by. Upon leaving Cody on US-20 you drive through a series of tunnels before emerging along the Buffalo Bill Reservoir. From here you drive up the valley passing a series of guest ranches and private property before entering Shoshone National Forest and ultimately Yellowstone itself. As we crossed over Sylvan Pass the way was light by moonlight and we drove by 12-15ft snowdrifts along the recently cleared roadside. We drove down toward the ice covered lake and ultimately arrived at the Yellowstone Lake Hotel completing our 500 mile day. Monday morning in Yellowstone. Rain. We headed to the North shore of Yellowstone Lake and then stopped to explore the Mud Volcanoes. Next, we drove into Hayden Valley and we say them. Grizzlys! There was a mother and two cubs foraging by the side of the road. After stopping to take pictures we headed to the South Rim of the Grand Canyon of the Yellowstone to see the Upper and Lower Falls. The rain had stopped and it turned out to be a chilly but nice afternoon. We headed back South and explored our hotel from the previous night before heading on to Grant Village for our dinner reservations. Tuesday morning we grabbed breakfast in Gran Village and headed North. Just before the Mud Volcanoes we saw the mother Grizzly and cubs again. As we were watching them someone told us a Bison was giving birth at the Mud Volcanoes. By the time we got there we had missed the actual birth, but only by 5-10 minutes. The mother Bison was cleaning off her calf. Springtime in Yellowstone...an experience like no other! 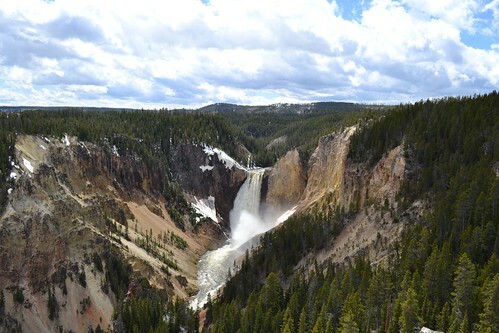 We spent most of the day on the North Rim of the Grand Canyon of the Yellowstone photographing the falls. Other than the wildlife this was one of my favorite parts of the trip. By mid-afternoon we headed North again, crossing over Dunraven Pass and on to Tower Roosevelt for our chuck wagon dinner. We loaded into the 'wagons' and made our way through a bison herd to our dinner spot. It was a very pleasant evening! After we returned to our car we headed for our hotel in Cooke City. This drive took us through Lamar Valley, and it started off right with a female black bear along the side of the road. The rest of the drive was full of amazing scenery as the sun began to set. It was a full moon that night and I cannot convey the feeling you get seeing a bison herd down in Lamar Valley by moonlight! We made it to our hotel in Cooke City and had a very relaxing evening after another big day. Wednesday morning we drove back to Tower Roosevelt through Lamar Valley. The wildlife was amazing yet again, but the highlight was seeing a mating pair of Grizzlys from about a half mile off! We spent some time at Tower Fall before heading on toward Mammoth Hot Springs. The drive was a pleasant one with a large male black bear sighting. As we approached the bridge before Mammoth we were confronted by a road block of two bison at the end of the bridge. After waiting patiently for a few minutes, they moved off of the road and let us pass. We spent the afternoon and early evening touring the hot springs. Sadly, they were mostly dormant, but the formations were amazing none the less. We spent the night in the Mammoth Hotel, which was my favorite 'old' hotel of the trip. Before heading South on Thursday, we drove into Gardiner and did some shopping. On our way back in we spent some time enjoying the arch. "For the benefit and enjoyment of the people." That really sums up what our parks are all about. Even if we don't realize it, we really do need them. And for those who have not figured out what wonderful, rejuvenating, places they are I feel sad. Everyone should visit these places and learn the lessons they offer. We spent a very busy day driving South to Old Faithful. 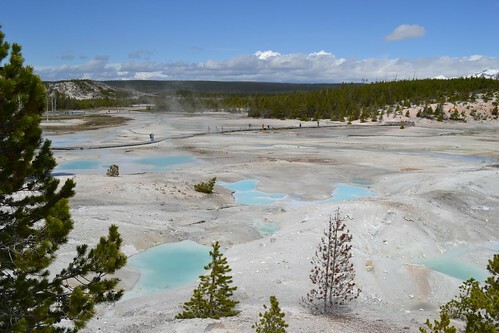 Along the way we saw the Norris Geyser Basin before driving across the middle of the park back over to Canyon for lunch and to visit the new visitors center. After returning to Norris we continued South, visiting the Artis Paint Pots, Gibbon Falls, etc. before leaving the park through the West entrance and visiting the town of West Yellowstone. We did not have much time to spend in West Yellowstone but we made time to visit the Grizzly and Wolf Discovery Center. Thought not as exciting as seeing a Grizzly up close in the wild it is much safer! I would recommend everyone spend an afternoon here, especially if you have kids. We drove back along the Madison River and then followed the Firehole River to Firehole Falls. We spent some time exploring Lower, and Middle Geyser Basins before checking into the Old Faithful Snow Lodge and eating dinner at the Old Faithful Inn. Dinner was wonderful and the hotel was amazing. I would highly recommend both! The most surprising part of the day was the even though it was June 16th, there was a heavy snowfall with very large flakes as we were walkign to dinner. The snow only lasted a half an hour and it didn't stick, but it was very magical. Friday was our last day in the park. We spent the morning at the Grand Prismatic Spring, but unfortunately it was cold enough there was a heavy fog. Before leaving the Old Faithful area we spent some time in the new visitors center. On our way out of the park we stopped by West Thumb and checked out the thermal features. We were unable to visit on Monday or Tuesday because a family of elk has made the area their home and the rangers had temporarily closed it. Though I was sad to be leaving Yellowstone, it was consoling to know that the Tetons lied ahead. The drive out of the park was very scenic and we soon found ourselves along the shore of Jackson Lake with the Tetons looming in the background. We spent most of the afternoon driving along US-89, seeing another black bear and cubs as well as two moose. At Moose we took the back country road to Teton Village and check into our hotel, the Hotel Terra. This hotel wasn't cheap, but it was fantastic, one of the nicest hotels I've stayed in. We drove down WY-390 to an excellent local Italian place for pizza. Exhausted from another long day we slept soundly in our comfy beds. Saturday. This was the day were were supposed to start heading home. But first we needed a little bit more playtime, so Colin and I started off our morning with a swim in the heated saltwater pool on the deck overlooking the gondola station. It was only 50 degrees outside but the pool was heaven. Seriously, I could have stayed in it all day. Next we took the gondola to the top of Rendezvous Mountain where it was 40 degrees and there was still snow! We had waffles at Corbet's Cabin before heading back down the mountain and driving into Jackson. We didn't have any spare time to spend in Jackson so we just drove through the town square and headed out. Out drive took us South along the beautiful Snake River on US-89/189/191. How confusing...both 89 and 189? Navigating from memory I took 89 when they split instead of 189 like I had wanted to. i realized my mistake shortly after but went with it because it was not going to add much time because we were going to Fossil Butte National Monument next. The drive out of the mountains was gorgeous and we even briefly crossed into Idaho (for 3 miles). We got to Fossil Butte shortly before they closed, but got to see most everything we wanted. From there we headed to Rock Springs where we had a somewhat late dinner. The drive through Southern Wyoming was very scenic, much different than the other parts of the state we had seen. Our original plan was to make it to Denver. Now you are probably wondering how do you get so much into one day, eat a late dinner in Rock Springs, and still make it to Denver by a decent hour? Answer is simple...you don't. We ended up spending the night in Cheyenne after a very long, but fun, 543 mile day. Sunday was rather simple, mostly driving. We went to look at the old train station before leaving Cheyenne and then headed straight to the REI store in downtown Denver. After looking around there for a couple hours we headed out to Noodles and Company in Stapleton for lunch. The rest of the 739 mile day was spent on I-70 with a stop in Colby for dinner. Though we were exhausted it was hard to come home! We saw some of the most beautiful places in our country and it was very hard to give that up. We had seen 13 bear (8 Grizzly, 5 Black), 2 Moose, Elk, Pronghorn, etc. We had seen mountains, grasslands, rivers, and dessert. We had driven over 3,000 miles, and taken over 4,000 pictures. It was truly one of the best weeks of my life.